New Delhi: Kiki came to stay with us for a few days. Her owners went to Calcutta on business. 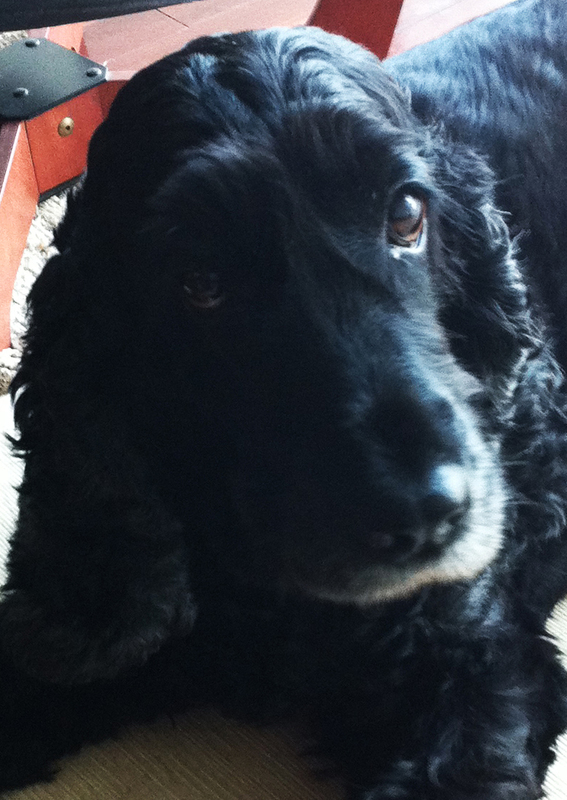 Kiki is a black Cocker Spaniel, 10 years old in October this year and people say if you multiply a dog’s age by seven, you get the equivalent age in humans; so she’s like an oldish lady now. Kiki was born in Thailand, moved to Japan with her Japanese owner, then to Bangladesh, Vietnam, back to Japan and now she’s in India. A much-travelled small dog, Kiki has her own immigration documents, a kind of doggie passport. I first met Kiki in Bangladesh 4 years ago and it’s a bit sad to see she doesn’t remember me at all. But she’s older now, seen a lot, she’s slower and can’t be expected to remember everything. Kiki comes towards me with her little pink ball held in the mouth, drops it in a practiced way so that it rolls towards me. I pick it up and throw it and she runs to get it, but after about four throws she has to stop and have a rest. We are given Kiki’s things in two small bags, food, blanket, toilet equipment, ball and her owners say bye-bye Kiki! and leave. Kiki spends a long time sitting at the patio door looking out, waiting to see if they’re coming back. But they’re not coming back; I try to engage with her, I try to speak with her in a kind of doggie-speak, cute high pitched baby chatter. But it’s not working very well because most of the time her owners speak to Kiki in Japanese. Kiki just looks at me, looks at Jiab, responds in a friendly way, but there’s a distance. Jiab and I are just the faces of this moment; she knows we are the carers. Kiki has had carers speaking to her in Thai, Bengali, Vietnamese and Japanese and, anyway, she’s limited because she’s a dog…. Now she’s just wondering which one of us, Jiab or me, is the one to whom she will be answerable; which one is the main provider of food and taker-out-for-walks? And it’s a new experience for us too, we don’t know much about looking after dogs. So I’m wondering how this’ll go, and thinking Kiki probably has that figured out already; the pros and cons of this situation, a naïve, abundant provider of tasty scraps from the table? So we’re eyeballing each other like this, a certain curiosity and interest in the air and Kiki is totally black like a photographic negative, I can’t see any face, only a strip of pink tongue hanging out. I’d be staring at her intently looking for a face then I discover it, see the black eyes, black nose and aware, all of a sudden, that Kiki is looking back at me! An encounter. Quite a lot of licking; affectionate doggie wetness – I put her food in the dish and there’s great excitement but she doesn’t eat, just sits there looking at it. I’m thinking maybe she doesn’t like it… but then she turns around and looks at me, face to face, eye-contact, quite a meaningful moment. A recognition; is it about gratitude? I say something like, go on then Kiki… and she starts to eat, tremendous crunching noise, her bowl-shaped dish amplifies the sound, and the scrape and clatter of the dish sliding on the hard floor as it gets pushed along by a long black nose. Maybe the hesitation at the start was her saying: look, I’m sorry, this is going to be noisy, okay? Same thing with water, I’m sitting at the desk quietly and there’s this huge shlooshing, splooshing sound. The ‘face’ of Kiki got to be more and more of a significant element in our communication – no expression, quite plain, just a kind of awareness: non-verbal gazing at each other. At one point I say to her: where’s your ball? and she immediately starts running around looking for it. I realise then that her Japanese owners must say that in English. So I get down on the floor and we are both looking under the sofa and the chairs. In the middle of all this, we look at each other, I’m on my knees, at her level. I say to her: I don’t know where it is… hold that gentle look for a moment: I don’t know… consider the enigma of our shared existence. There’s something about this that gets my attention, she just looks. I come closer and look again at her dark face placed in a dark wooly body. There’s a little movement of the head. I look under the sofa she’s sitting next to and there is the ball! Difficult to reach because it’s behind the bar but I can just get it, flick it out and Kiki runs off across the room chasing it. She catches it and comes back to me, drops it and I have to throw it again…. Hi Aya, for some unknown reason I didn’t reply to any of the comments here. Apologies, how is Kiki doing now, still in Wales? Sorry Ellen, just realised I never replied to your comment here. It was Sue (see below) who brought me back to the Kiki post. I wanted to ask about your vision of Ko-ko you mentioned, after she passed? Yes, that sounds like Ani. The communication is almost wordless, though she understands the words. The ‘worst’ is when she loses the ball and I ask her to find it, and tell her I haven’t got it… the look of sheer disbelief…. I wonder if they think the same when we finally understand their mode of communication too?